A floor lamp does more than just add light to a room. It can also help enhance your overall decor and can tie the look of a room together. Depending on the type or style of floor lamp you get, it can help illuminate certain tasks. In some cases, a floor lamp increases the amount of ambient light in a room. When you’re choosing a light for a room, you want to pay attention to its style, material, size, and lampshade. Use this guide to help yourself better understand all the options available and to help yourself choose the best lamp for your lighting needs. Types of floor lamps range from ones specifically designed for task lighting to ones specifically designed to increase the amount of ambient lighting in a room. Some lamps have multiple light sources, allowing you to direct light to different areas of the room. A swing arm floor lamp allows you to adjust the position of the lamp based on your particular lighting needs at the moment. If you need the lamp to shine on an area, you can just move the arm to adjust the light, instead of picking up and moving the entire lamp. A torchiere lamp enhances the ambient light in a room by creating an uplight. The light produced by torchiere spills out of the top of the lamp. It’s a good choice if you want an accent lamp or just need to boost the amount of overall light in a room. Torchieres aren’t good choices if you need task lighting. A tower floor lamp kills two birds with one stone. It provides a gentle glow and some accent lighting in a room. When the lamp isn’t turned on, it resembles a piece of sculpture, enhancing the beauty of a place. Often, tower lamps feature a wire frame that is wrapped in tissue paper or a very thin fabric. Don’t confuse a floor table lamp with another type of table lamp. A floor table lamp is a multi-tasker. It is a floor lamp with a table attached to the center of it. This type of lamp is an excellent option when you don’t have much room and would like a table and a lamp. You can find floor table lamps made from glass or out of wood. 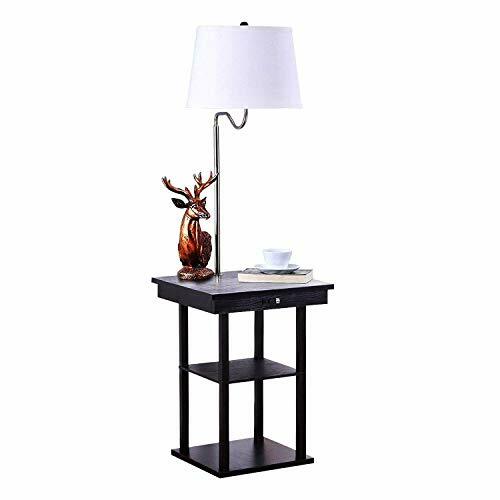 Visually, a combined floor table lamp is less intrusive than an end table with a lamp on top of it or than a separate floor lamp and end table. A club lamp is also known as a standard or traditional floor lamp. It’s essentially a narrow column with a light on top. Different styles of club lamp are out there. For example, some might have a decorative column while others feature a single, plain pole that attaches to a basic lampshade at the top of the lamp. A multi-way or tree floor lamp is simply a lamp with multiple lights on it. You can position the lights at a variety of angles, based on what you need to illuminate. Although plenty of people associate tree lamps with their dorm room days, it is possible to find a multi-arm lamp that is sophisticated enough to use in the home of a fully grown adult. 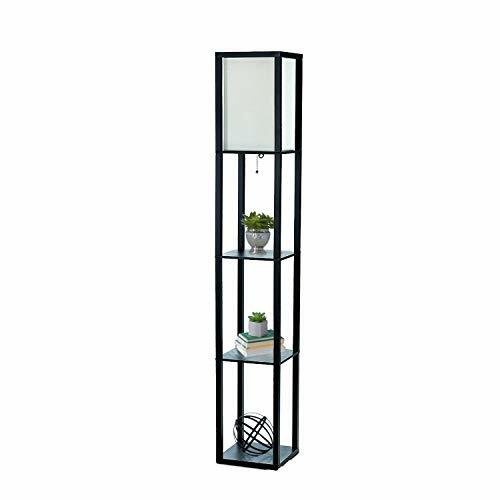 A task floor lamp usually has an adjustable light, which you can move and point in the direction of your book or a table. Occasionally, a task lamp is called a downbridge lamp. The big difference between the two is that a downbridge lamp directs light downward and doesn’t have an adjustable light. A candelabra lamp is like a multi-way lamp, as it has multiple light bulbs. But, the bulbs on a candelabra lamp are usually smaller than the bulbs on a standard multi-way lamp. Additionally, these lamps typically look like electric versions of traditional candelabras. 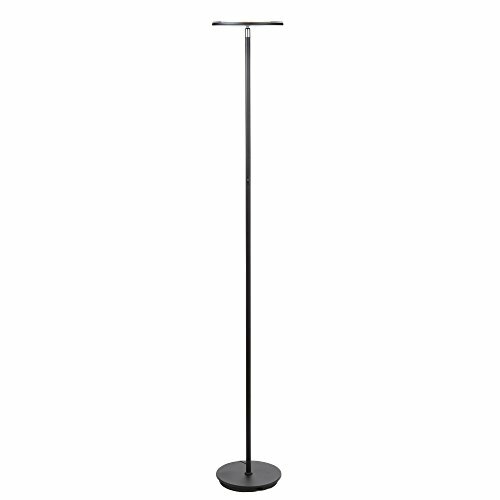 An arcing floor lamp features a long arm that attaches to the base of the lamp. The long arm allows the lamp to extend out and over a piece of furniture. Arcing floor lamps are usually very dramatic and are an ideal way to light an entire seating area, such as a whole couch. You can also position one over a dining room table, instead of lighting the table with a chandelier or overhead light. A novelty floor lamp can be any style of lamp that has something quirky or unusual going on. For example, one type of novelty floor lamp converts into a sweeper, so you can keep your floors clean. Once you’ve found the kind of floor lamp that works for you, it’s time to start thinking about the style that blends best with your decor. Luckily, there are almost as many styles of floor lamp as there are decorating styles out there. First made popular in the middle of the 20th century, mid-century modern has experienced a revival in the 20th century. Several features define mid-century modern styles, such as clean lines, an uncluttered look and a preference for function as well as form. If the first thing you think of when you hear “Scandinavian” is IKEA, it’s worth knowing that there’s a lot more to Nordic or Scandinavian style than the designs produced by the discount furniture chain. Like mid-century century modern, Scandinavian style is often marked by a preference for minimalism and clean lines. Mission Shaker lamps are inspired by or related to the Arts and Crafts or Craftsman furniture movements, made popular in the 19th century. Geometric shapes and clean lines are two major features of the style. Country style means different things to different people and can vary based on area or location. But a few factors commonly link country styles, such as a rustic feel, muted or soft colors and a well-worn, vintage look. Tiffany glass is a style of elaborate stained glass designed and created by Louis Comfort Tiffany back in the 19th century. Original Tiffany lamps typically cost thousands of dollars to more than a million dollars. But for the more budget-conscious consumer, there is a wide range of “Tiffany style” floor lamps out there. These feature decorative glass shades and often cost a fraction of the price of a real-deal Tiffany lamp. Like country style, industrial style has a bit of a rough-hewn look to it. In the case of an industrial floor lamp, you might see one made from a material such as cast iron or unfinished wood. A bare Edison bulb is usually a hallmark feature of the style. “Contemporary” is often a catch-all term used to describe styles from the last half of the 20th century until the present day. Like Mid-Century Modern and Scandinavian styles, minimalism is a hallmark of contemporary style. 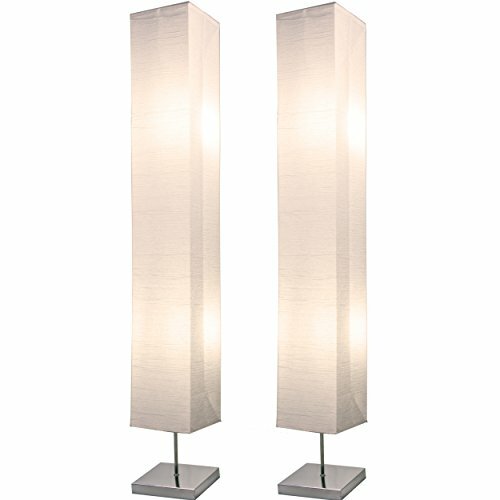 Contemporary floor lamps usually feature neutral colors and clean lines. Bohemian style tends to take a more is more approach to decorating. It’s not afraid of pattern, texture and bright colors. Often, a home with a boho aesthetic will feature a variety of mixed and matched patterns, creating an eclectic, jumbled feel. When it comes to floor lamps, boho style lamps typically feature some pattern on the lampshade or some textural element, such as a beaded shade. Many floor lamps come with a lampshade when you buy them. But lampshades aren’t permanent fixtures. If you don’t like the shade that came with your lamp or if you want to spruce up the look of an older lamp, you can easily swap out an old shade for a new one. Here are some things to keep in mind when finding the right shade for your floor lamp. Generally speaking, the shape of the lampshade should reflect the shape of the lamp itself. A rounded shade will work best with a lamp that has curved lines or with a club lamp that has a base made out of stacked balls. A rectangular or square shade will work best with a lamp that has sleek, straight lines. You have two things to consider when choosing the size of your lampshade. One is its height. The other its width. Rule one: always make sure the lampshade completely covers the bulb and socket on the lamp. Otherwise, things will just look weird. Rule two: choose a shade that is about 30 to 40 percent of the height of the lamp. Any smaller and the shade will look too small. Any larger and the lamp shade will overwhelm the rest of the lamp. Rule three: Make sure the width of the shade isn’t wider than the widest point of the lamp’s base. To reduce the risk of burning the shade, it needs to be at least 3 inches wider than the light bulb. Keep in mind that the wider the lamp shade, the more light your floor lamp will give off. The more opaque the material a lampshade is made out of, the less light the lamp will give off. If you want your floor lamp to give off a good amount of light, you’re best off choosing a shade made out of a translucent or otherwise see-through material, such as loosely woven linen or cotton. Color also influences how much light your lamp gives off. A dark-colored shade will block a fair amount of light while a light color will let more light through. If you aren’t happy with the color selections you see online, or at local stores, you can always try to make your own lampshade. You have a few things to think about when choosing the right height for your floor lamps. A too-tall lamp will overwhelm a room with low ceilings while a petite floor lamp will look out-of-place in a room with 13-foot ceilings. If you’re concerned about seeing the bulb or socket in the lamp from any angle, 68 inches is the recommended height for a lamp. At that height, you won’t be able to sneak a peek of the bulb when you’re sitting down or standing near the lamp. If you’re a bit more flexible about seeing the bulb or socket and are more concerned with matching the height of the floor lamp with the features of the room, pay attention to the size of other lamps or furniture in the space. Ideally, the height of your floor lamp will be the same as the height of any table lamps resting on tables or other surfaces. Matching heights creates a uniformity in the room and establishes balance. The material a floor lamp is made from determines its overall style and look as well as its price. Here are a few of the more popular materials you’re likely to see in a floor lamp. Wooden floor lamps can either given off a contemporary vibe or a rustic, country air. It all depends on how the wood is shaped or carved. A rough-hewn wood usually works in with a country or rustic decor scheme. Meanwhile, a sanded and carved wood works with a mid-century modern or contemporary style. A metal floor lamp can be an attention-grabbing showpiece, such as a tall, arcing lamp made of shiny chrome. 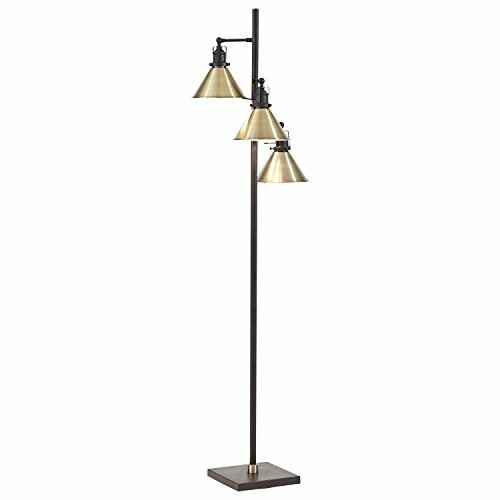 Alternatively, a simple metal pole lamp can blend in with the rest of the features of the room, not calling any attention to itself. Since it is hefty and can get quite expensive, you’ll often see stone used as part of the base of a floor lamp, but not as the entire base. Usually, the stone is combined with a lighter weight or less expensive material. Tower floor lamps are often made from a thin rice or tissue paper, wrapped around a wire base. Like stone, ceramic is often combined with a lighter weight material to form the base of a floor lamp. The ceramic might serve as an accent on the lamp rather than as the entire base. But some lamps also feature a base made up entirely of ceramic. 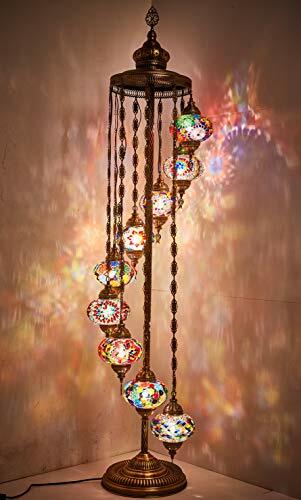 These lamps tend to have a larger footprint than other styles. Choosing the right light bulb for your floor lamp can involve almost as much thought and consideration as picking out the lamp. Most likely, your lamp will call for a particular type of bulb, whether it’s a standard bulb or a halogen light bulb. Understanding the differences between bulbs can help you when you’re picking out the perfect floor lamp for your home. Incandescent light bulbs are classics. They’re the bulbs created by Edison back in the 1800s. Incandescents have a few advantages, mainly that they are inexpensive and produce a warm glow. The disadvantage of them is that they aren’t very energy efficient and they typically have a very short life. Energy efficiency standards, passed in 2007, have meant that the classic incandescent bulbs are largely being phased out. One exception is smaller bulbs designed for use in chandeliers or candelabras. Back when people were first getting concerned about the amount of energy light bulbs used, compact fluorescent (CFL) bulbs seemed to be the answer. These bulbs fit into the same socket as incandescent lights. But they use considerably less energy to produce the same amount of light, and they last a lot longer. CFLs aren’t perfect though. They typically contain mercury, meaning they need to be recycled or disposed of properly. They also often produce a cool, glaring light, rather than a warm light. Today’s LED bulbs give both CFLs and incandescents a run for their money. In fact, if you’re buying a floor lamp that takes a standard bulb, you’ll most likely want to use an LED bulb with it. Here’s why. LED bulbs can last for around 20 years. They use the least amount of energy compared to CFLs and incandescents. Unlike CFLs, they don’t contain mercury. Originally, LED bulbs had a high price tag to match their long lifespan and energy efficiency. But thanks to advances in technology, you can easily find an LED bulb for less than $5 these days. Some floor lamp models require the use of halogen bulbs instead of standard light bulbs. Depending on the style, these bulbs might have a different socket than your typical bulb, so you can’t always trade in a halogen bulb for a basic incandescent or LED bulb if you prefer. Two features separate halogen bulbs from standard incandescent. For one thing, they contain halogen gas, which helps them to be slightly more energy efficient. For another thing, they tend to get a lot hotter than your typical light bulb, which can be an issue in the heat of summer. Xenon light bulbs are also a type of incandescent light, but they get some energy from xenon gas. You might be more familiar with their use in car headlights, but some floor lamps do require or recommend using a xenon bulb. Xenon offers several advantages over standard incandescent bulbs and even over halogen bulbs. For one thing, they have a considerably longer life, up to 10,000 hours. For another, they don’t get quite as hot as halogen bulbs. You can usually use xenon and halogen bulbs interchangeably in a floor lamp. What else should you think about when buying a floor lamp? Here are a few more things to consider. In the age of discount stores, it’s very easy to find a floor lamp for under $20. At IKEA, for example, you can find a uplight floor lamp for just $6.99. Meanwhile, designer or antique lamps typically cost hundreds or even thousands of dollars. A genuine Tiffany lamp sold for $123,000 at an auction in 2009, for example. What you can spend on lamp depends on your budget and your preferences. A $7 lamp might provide some illumination, but it isn’t going to make much of a statement when it comes to a style or design. Meanwhile, a genuine or reproduction mid-century modern lamp might be worth the higher price tag if it complements your overall decor. Additionally, it might be worth spending a bit more on a lamp that is made of sturdy, durable materials such as stone, wood or metal, versus spending $10 or $20 on a flimsy plastic lamp. Where you’ll use the lamp and what you need the lamp to do will influence the type of lamp you end up buying. There are a few other factors and features to consider when selecting your floor lamps. Sometimes, you want to set the mood in a room and adjusting the lights can help you do that. Some lights feature built-in dimmers, which allow you to turn the brightness up or down. You can also purchase a dimmer kit separately and install it on the lamp if you wish. Not every type of bulb can dim, though. For example, many LEDs can’t be dimmed. If your lamp doesn’t dim, a solution might be to look for one with multiple light sources or multiple lamps. That will allow you to adjust the brightness of the lamp as needed. If you purchase a floor lamp with combined task lighting and uplighting, you’ll be able to adjust the light as needed by turning both lights on or by turning one off and the other on. Ideally, you’ll want a floor lamp that uses the most energy efficient bulbs available. Why pay more than you need to light your home? Some of the more energy efficient bulbs, like LEDs, typically cost more than other options. But the tradeoff is that they last so much longer. Plus, today’s LED bulbs are usually much less expensive than the bulbs produced a few years ago. You not only want to be able to adjust the brightness of the lamp. It can also be helpful to be able to change the height and direction of the lamp. Some floor lamp models feature telescoping columns or posts so that you can raise and lower the height to work with the height of the furniture in a room. Some, such as swing arm lamps, let you adjust the position of the lamp as well. Floor lamps come in a range of colors, from basic neutrals to bold and bright hues. It’s up to you to decide if you want a lamp that blends in or one what stands out. One option is to choose a lamp with a neutral base and a colorful or patterned shade. You can swap out the shade for a different color or pattern if you get tired of it.